The first cabbie shelter was erected in London, in 1875, at the instigation of Sir George Armstrong, a newspaper publisher who sent his servant out one blustery January day to fetch a cab from a nearby stand. The servant was a long time returning because the drivers had all abandoned their cabs and retired to the warmth and conviviality of a local pub. Shortly thereafter, Sir George, with The Earl of Shaftesbury and a few philanthropic friends, decided to create a cabbie’s charity called the Cabmen’s Shelter Fund. The cabmen’s shelter was designed to provide drivers with a place to get in out of the cold and have a cheap meal without straying from the cab stand. By this provision, it hoped to keep the cabbies out of the pubs. The Hon. Arthur Kinnaird publicly opened the first of ‘these moveable huts or pavilions, with glass sides in Acacia Road, St John’s Wood, in February 1975. Between 1875 and 1914, a total of 61 shelters were built at cost of around £200 each. 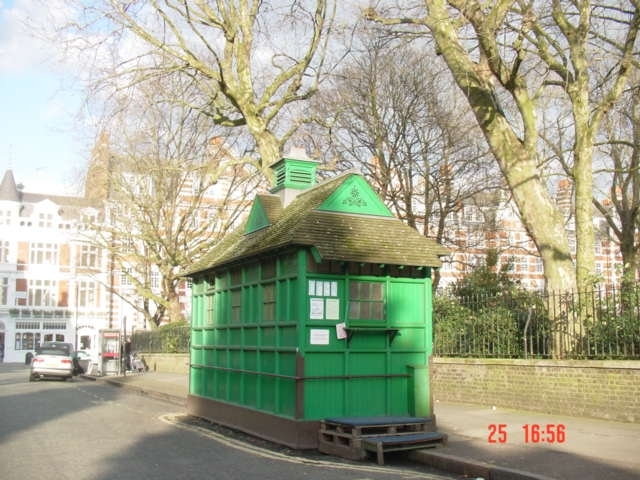 Because these green, garden-shed like shelters stood on a public highway, the police stipulated that they were not allowed to be any larger than a horse and cart. Yet even with these restrictions, they squeezed in a working kitchen and seated up to 13 men to provide shelter and hot food for the drivers of hansom cabs and hackney carriages (taxis). Each shelter was to be ‘supplied with gas, water and a stove for cooking purposes and will be place under the charge of a competent attendant’. Cabbies brought their own mugs , which were kept for them at the shelter and looked after by the ‘shelter boys’. Thirteen of these shelters, all positioned within a 6-mile radius of Charing Cross, still exist and are maintained by the Cabmen’s Shelter Fund, and are all Grade II listed buildings. One of these is situated in Wellington Place, near the entrance the St John’s Church Grounds. Cabmen’s Shelter 1888. Timber framed, tongue and groove timber panels; felt clad timber roof. 7 bays by 3 bays. Entrance to centre of north side. Windows to upper wall in second, fourth and sixth bays. Stump of fleche to roof. The Fund has been aided in the restoration and maintenance of the shelters by the Heritage of London Trust, and other donors. The shelters are now run by tenants who pay a contribution to the Charity to maintain the shelters, and still sell hot drinks and sandwiches. This page was added on 08/04/2012. This body was about 4 (so 1951) and being pushed to the ‘Swings’ by my Aunt. The Lady who cooked here leaned out of the window and gave me a hot piece of Treacle Tart. It was the best thing I have ever tasted. Wonderful memories. Thank you.